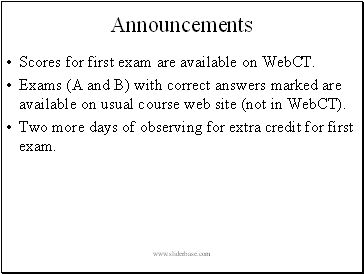 Scores for first exam are available on WebCT. 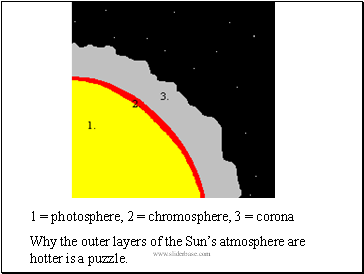 Exams (A and B) with correct answers marked are available on usual course web site (not in WebCT). 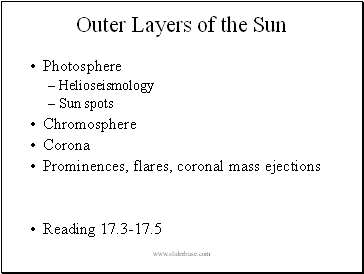 Two more days of observing for extra credit for first exam. 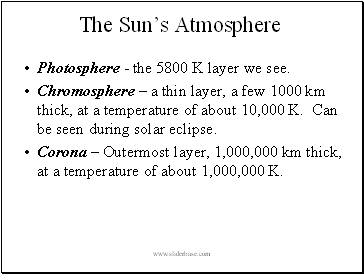 Photosphere - the 5800 K layer we see. 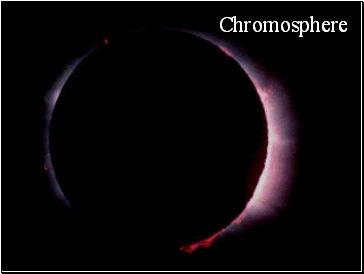 Chromosphere – a thin layer, a few 1000 km thick, at a temperature of about 10,000 K. Can be seen during solar eclipse. 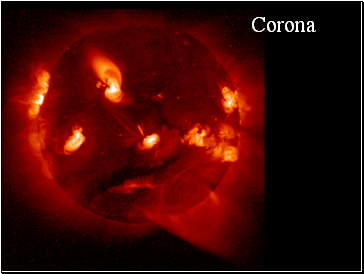 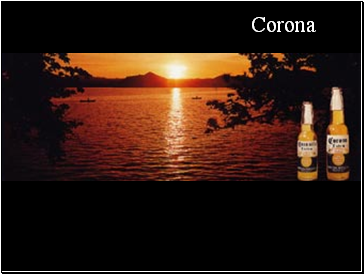 Corona – Outermost layer, 1,000,000 km thick, at a temperature of about 1,000,000 K.
Why the outer layers of the Sun’s atmosphere are hotter is a puzzle. 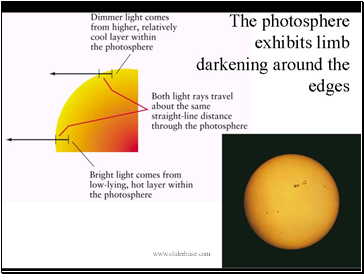 The surface of the Sun vibrates up and down in oscillations which can go deep through the Sun. 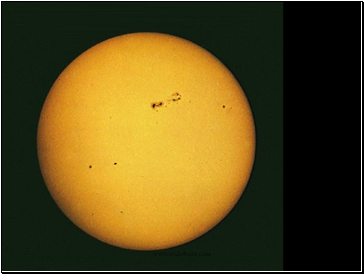 We can observe these oscillations from Earth by looking at the Doppler shifts of different pieces of the Sun. 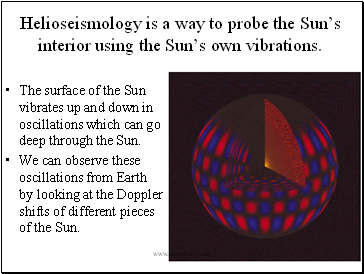 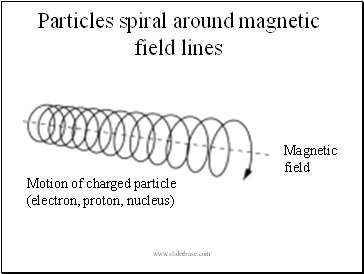 Helioseismology is a way to probe the Sun’s interior using the Sun’s own vibrations. 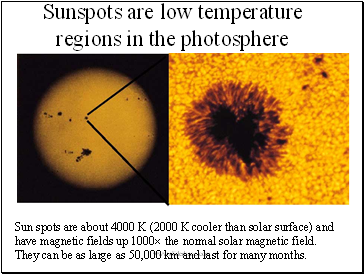 Sun spots are about 4000 K (2000 K cooler than solar surface) and have magnetic fields up 1000 the normal solar magnetic field. 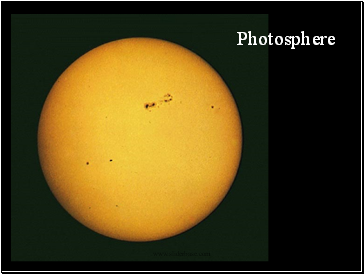 They can be as large as 50,000 km and last for many months.